Dental restorations can be divided into two broad types : Direct Restorations and Indirect Restorations . All dental restorations can be further classified by their location and size. A root canal filling is a restorative technique used to fill the space where the dental pulp normally resides. This technique involves placing a soft or malleable filling into the prepared tooth and building up the tooth before the material sets hard. The advantage of direct restorations is that they usually set quickly and can be placed in a single procedure. Since the material is required to set while in contact with the tooth, limited energy can be passed to the tooth from the setting process without damaging it. Where strength is required, especially as the fillings become larger, indirect restorations may be the best choice. This technique of fabricating the restoration outside of the mouth using the dental impressions of the prepared tooth. 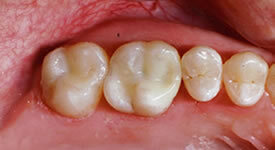 Common indirect restorations include inlays and onlays, crowns, bridges, and veneers. Usually a dental technician fabricates the indirect restoration from records the dentist has provided of the prepared tooth. The finished restoration is usually bonded permanently with a dental cement. It is often done in two separate visits to the dentist. 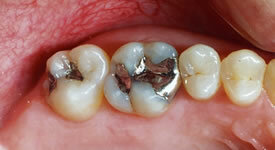 Common indirect restorations are done using gold or ceramics.